Ruby Records did it again! 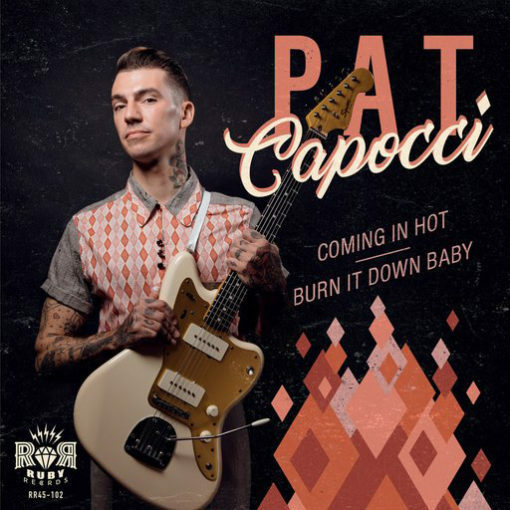 After launching the label with none other than Big Sandy and the Fly Rite Boys they joined forces with Australia’s number one rocker, mister Pat Capocci and the result is another killer single. 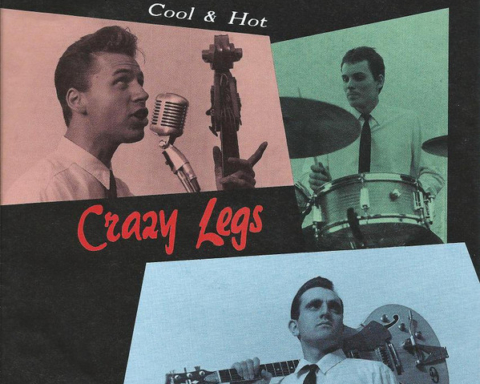 Side A is a crazy rocker with wild drums, rockin’ piano and Pat’s guitar all over. Side two is bluesier, with a bit of Jimmy Reed’s Shame, Shame, Shame on the beat, and a perfect dirty guitar sound. 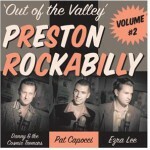 This is Pat Capocci’s second lp and third release if you count Preston Rockabilly vol. 2. And once again it’s been recorded by Graeme Thomas one of the most talented man when it comes to record roots music. Capocci is backed by the finest musicians you can find on the Aussie’s scene, namely John Flynn and Cal Robinson on bass, Ezra Lee on piano, Ricky ‘the goet’ on drums and Danny Wegzryn on harmony vocals. This album marks a slight departure in Pat’s sound and shows the young singer/guitarist focusing on his harder stuff. 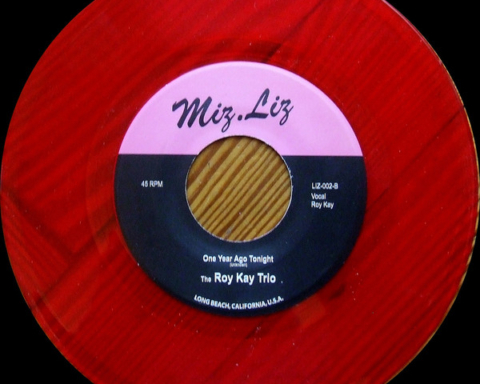 Thus one can hear on a majority of songs the influence of Dale Hawkins (and his two guitar players the great James Burton and Roy Buchanan) as well as Roy Hall. This is for the core of the lp, but one will also find a Texas blues shuffle (Sally Ann), a Bo Diddley Beat (Delinquent Beat) and a jazz ditty (Barebones Barber Shop). The latter made me think how good it would be to hear Pat and Ezra Lee doing an album worth of King Cole inspired material. All My Fault evokes the sound of Carl Mann. Talkin’ about Sun pianists, the listener will also hear in Lee’s piano shades of Charlie Rich too. Capocci’s Crawl is a fine instrumental with a swamp mood while Clifton Chenier’s All Night Long(the sole cover of the album) is turned into a mean rocker. Believe me when I say that “Delinquent Beat” is without a doubt one of the best rockin’ record released this past decade. 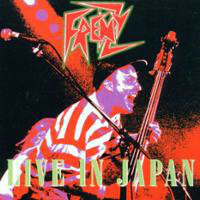 Dead End Track / The Pickle / Way Too Long / Gonna Have Me Some Fun / Shake Me Up / Mary Jane / Sick And Tired / Steppin’ Out / Hillbilly Girl / Give Me A Break / Blue Skies Turn Grey / Chasin’ My Tail / Free And Easy / News Travels Fast (And So Do You). Pat Capocci is nothing else than one of the best thing to happen to modern rockabilly in years. “Modern” is probably not the right word to describe the sound of this rockin’ cat. He often sounds as if he came straight from the fifties. And this guy has the whole package that would make more than one envious: he has the look, the songs (he penned all songs but two on this album), the sound, the voice and he’s more than able when it comes to deliver a hot (or a smooth) guitar solo. On Steppin’ Out, his debut album, he shows the wide range of his style and skills. 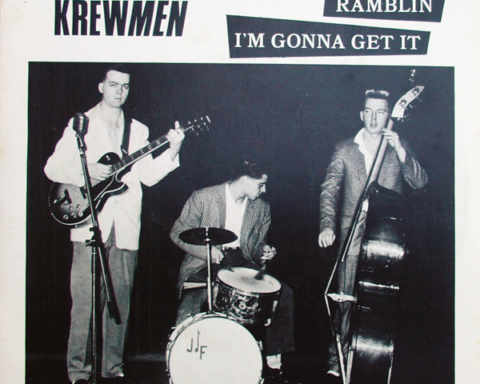 Needless to say that Rockabilly stands in good position with songs like Dead End Track, Steppin’ Out or the excellent Blues Skies Turn Grey that reminds me a bit of Al Ferrier (yes, he is THAT good). There’s also a couple of wild rockers like Free and Easy, Give Me A Break (with a Grady Martin-esque baritone guitar) or the frantic Mary Jane. Pat is also more than able to deliver some hot blues songs, like the Pickle, an instrumental with piano in the style of Johnny Guitar Watson, and Shake Me Up. Gonna Have Some Fun leans more on the jazz side, but is equally successful. At this point, I can believe what you’re thinking: It would be too good to be true if this young cat could also play country music. You bet he can! And with style! Just listen to the hillbilly bop of Hillbilly Girl and Chasin’ My Tail (both featuring Rick Dempster of the Dance Hall Racketeers on steel guitar) the latter having a touch of Buddy Holly’s Gotta Get You Near Me Blues. News Travels Fast (And So Do You), an excellent country shuffle that seems to come straight from the 60’s, rounds up the set with class. 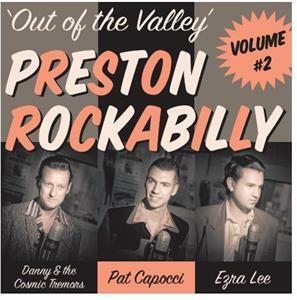 Pat Capocci, Ezra Lee and Danny Wegrzyn (Danny & the Cosmic Tremors) are three Australian cats who play in each other bands. 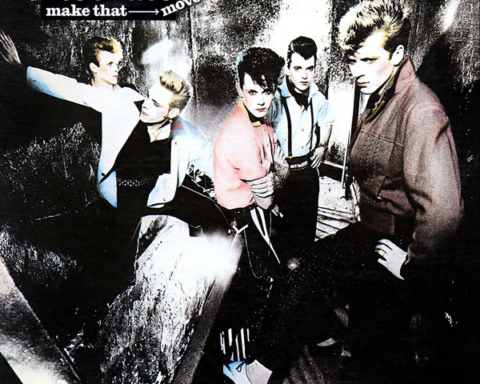 For this album they went to Graeme Thomas’ Preston studio with Cal Robinson on bass, Paul Hainey on drums and Dave Cantrell (the Wildcats, Toni & the Tomcats) on steel. 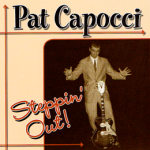 Pat Capocci performs six songs, all self penned. Full Grown Woman is one of his wildest track, almost garage, Second Best is a traditionnal rockabilly, Burnin’ the Candle is a solid rocker. He also performs a country shuffle (Try To Forget Me), a Jerry Lee type of number (Til I Get to You) and a superb instrumental (After Hours) that has shades of T-Bone Walker and Johnny Guitar Watson. 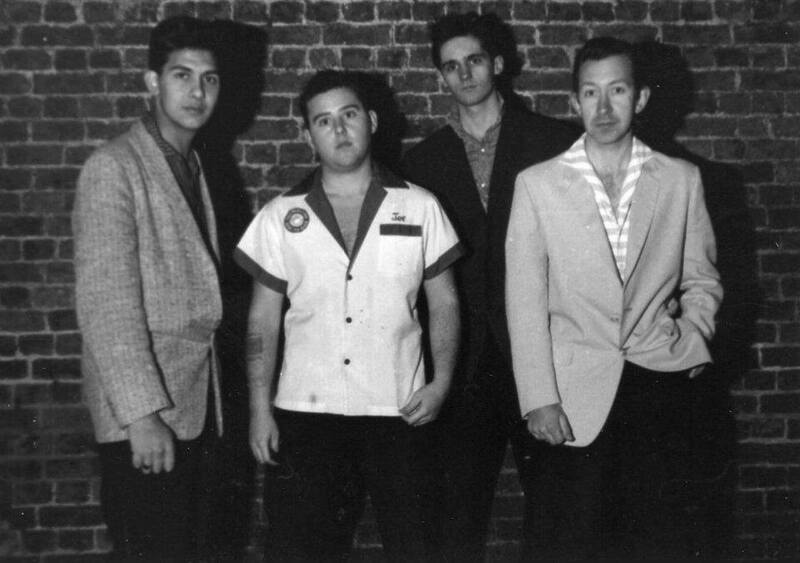 Danny & the Cosmic Tremors perform five songs (four origiuals and one cover) including two classic rockabillies (my Baby Wants to Rock’n’Roll, So Long). Much wilder is the cover of Bill Johnson’s You Better Dig It. Little Darling, as its title indicates, is a smooth ballad and Feel Allright With You is a hot bopper that reminds me the style of Rip Carson. Last but not least, Ezra Lee, the piano pumpin’ man, is present here with two rockers (Abby Jane and Goodbye Astrid Goodbye), a strong Rockabilly number (Werris creek Devil). 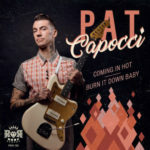 I’m Gonna Kill Your Daddy sees Capocci playing a mean slide guitar that evokes Elmore James and Coalfire Man is more in the style of memphis Slim. 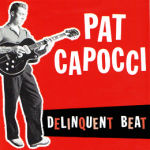 Share the post "Pat Capocci (reviews)"